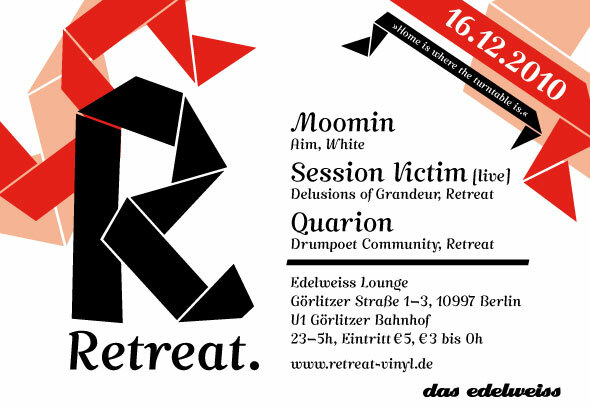 For the last Retreat party of 2010, we’re happy to invite Moomin, a fresh talent within the Berlin scene. This music-obsessed young cat has been collecting Hip-hop, Funk and Jazz since the early 90’s before discovering the beauty of House music at the turn of the millenium. A member of the always reliable White collective, Moomin has played in most of Berlin’s major clubs and has released groovy SP-1200 workouts on Aim and the aforementioned White imprint. Our friend has a deep knowledge of the art of moving butts, so we’re very eager to dance to his set in Edelweiss! Session Victim will also be performing their incendary new live show…so despite the polar temperatures in Berlin, expect sweat to be dripping off the walls as the Masked Avengers tweak their Nu Funk formula to perfection! Although their DJ schedule is beginning to get packed with gigs all over Germany, Australia and England, the duo still spends most of its time in the studio working on new material as well as remixes for Future Classic, Farside or Z Records among others….trust us, you won’t escape Session Victim in 2011! Making sure the party starts on a good note, Quarion will play a quality selection of Boogie, Funk and Deep House at the beginning of the night. On the production front, the Q-man is about to release a sonic postcard from the “Moons Around Jupiter”, a four-track EP that easily ranks as some of his best work so far…and of course it’s on Retreat! 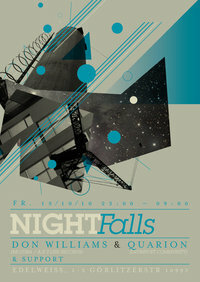 So come down to Kreuzberg’s busiest basement and party with us as we close the 2010 chapter with a blast! Back in December 2009, Iron Curtis dropped a killer set at Edelweiss… but the best was yet to come a few months later: the Iron Man submitted a mind-blowing demo to Retreat and the outcome is “Stumbled Across”, a bold musical statement that gets released this week. Of course we had to throw in a special party for that! Iron Curtis’ contemporary take on Chicago House through releases on Mirau, Mule or Jackoff has won him accolades left and right. But his musical knowledge is not limited to four-to-the-floor bangers and you can hear shades of Hip-Hop, Soul or Dubstep in Mr. Curtis’ productions. He’s also a very solid DJ and we can’t wait to see him turn Edelweiss upside-down once again! We’re also excited to have Quarion back with one of his great live sets. He admits himself that Edelweiss is one of his favourite spots to perform and try out new music. 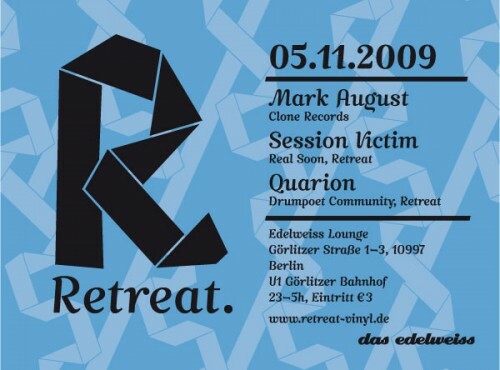 Having just finished producing a rather interstellar EP for Retreat, the Q-man promises a live show full of surprises…but without compromising on the bounce factor! Last but not least, Session Victim will make sure that the party starts RIGHT with their choice of quality Disco, Funk and slo-mo House. These musical brothers are currently one of Dance Music’s hottest properties, thanks to their distinctive “Cut-up groove” sound that burns dancefloors everywhere. And it’s only the beginning! Definitely one of the best parties you’ll stumble across this month! After a little summer break, we’re happy to continue our residency in Edelweiss with a magical lineup that should kickstart the indoor party season! 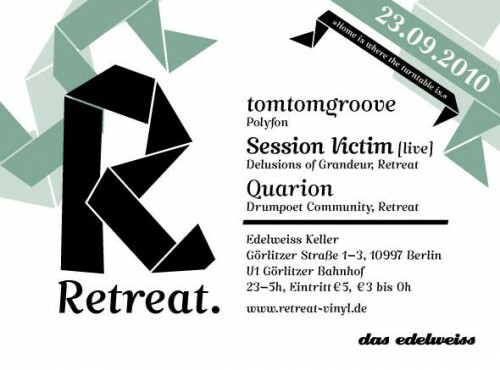 Our special guest this month goes by the name of tomtomgroove and has been an important figure in Berlin’s underground House scene since the late 90’s. Thanks to his deep musical knowledge and faultless mixing skills, tomtomgroove has been playing in some of the city’s best clubs (Tape, Horst and Arena among others). Tom is also a talented producer who has released on Polyfon and Konsequenz while his track “Mr. Funkman” got licensed for Dinky’s “Get Lost 3” Mix on Crosstown Rebels. Another highlight will be Session Victim‘s first ever live set for our monthly Retreat party! From Zürich to London via Hamburg, the dynamic duo have been turning many clubs upside down with their funk-infused live performance and we’re certain that Edelweiss will be no exception. Having just finished another wicked EP for Delusions Of Grandeur aswell as a few remixes, Hauke and Mathias are bound to make big waves in the upcoming months. Take notice! Come and join us for another great musical treat! We’re happy to see Hunee making his long-awaited return to the Edelweiss cave. Arguably one of Berlin’s finest DJ’s, he has been recently playing to places as far as Seoul or Tokyo, thanks to a well-deserved buzz he achieved via his essential releases on W.T. Records, Internasjonal, Feel Music and Drumpoet Community among others. Hunee’s exciting Disco and House selection combined with his pumping DJing style will definitely have the Edelweiss crowd getting into a frenzy! Hauke Freer has been quite busy touring as well, sharing DJing and Live duties with his Session Victim compadre Matthias Reiling in spots all over Germany or London. Hauke is known for his energizing blend of groovy bits, whether it’s Hip-Hop, House or Disco, so you can be sure he will get the party started! A family affair that is open to all music lovers, this event is simply not to be missed! The march edition of Retreat @ Edelweiss is the release party for our first 2010 record, “Treats vol.2” and we’re very excited to have once again the great Finn Johannsen as special guest! Finn runs the Macro imprint with Stefan Goldmann and played a memorable Deep House set back in august 2009. His knowledge of great music is unfathomable and we just had to invite him again in order to dance to his incomparable selection of all good things with a groove! Also on the bill are the inseparable Session Victim boys, now a very hot property within the scene, thanks to a mind-blowing release on Delusions of Grandeur! The duo will make you bounce to House, Funk, Disco and everything in between. Last but not least, Quarion is back on the 1’s and 2’s after february’s live madness for a special warm-up set that should make you forget your drink and start shaking your thang on the dancefloor! Join us once again for an unforgettable night! We’ve decided to start 2010 with a little disco flavour: Ireland’s mighty Mano Le Tough and Berlin’s own Elie Eidelman (aka DJ Humus) will be playing with us in Kreuzberg’s most soulful cave. Mano has been releasing disco-tinged gems on Prins Thomas’ Internasjonal and Tensnake’s Mirau imprints, so this should give you a good idea of how talented the man is! Our second guest has been a regular in some of Berlin’s most prestigious clubs and is now organizing the successful “Jackoff” parties with co-conspirator John Osbourn. Elie has also just released his groovy debut 12″ in collaboration with Dekay on Dirt Crew Recordings. 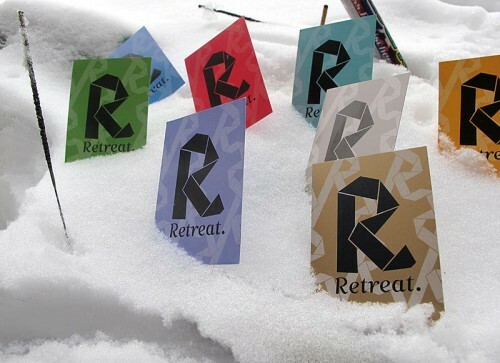 Last but not least, Retreat’s own Quarion will provide the dancers with some appetizing Boogie and sloooow House in order to get the party started! Miss at your own risk! Back once again for our monthly session, this time we’ve got Nü Berliner Mark August in the House! For those who are unfamiliar with his work, Mark has been quietly releasing tracks of cinematic scale on labels as various as Innervisions, Perspectiv, Connaisseur or even Cocoon! Mark has been a bit off the radar these last few months BUT, with his own label due to be launched with help from the mighty Clone people and with new mind-boggling tunes to introduce it, we think that Mark is about to get his own well-deserved piece of the Techno pie. Expect the unexpected from his set! Joining Mr. August will be the always impeccable groove of the Session Victim duo (who are about to release a supa-fresh EP on Real Soon) and a freestyle selection from your host with the most, Quarion.